Barb King shared that Barrington Living History Farm in Washington, Texas has finished their curing process for the pork, tested it in the kitchen, and found it to be very tasty! They’ve also started a new Myth Busting Monday series for Facebook, beginning with “Kitchens were placed separately to prevent houses from burning down”. They anticipate it will be fun to explore those myths with visitors. Ed Schultz shared the Historic Farming program at Colonial Williamsburg is undertaking a short training program for the some of the site’s “Nation Builders” through a series of hands-on experiences. Interpreters portraying important people of 18th century Williamsburg like James Madison, Aggie of Turkey Creek, Thomas Jefferson, and George Washington engage in real work activities to develop a better cognitive and visceral understanding of the work underpinning the 18th century lifeway. Activities include plowing, hilling, planting, weeding, and picking worms off tobacco. Plans for the annual plowing match at the International Conference in Ontario are coming along. A site has been selected and the conference committee are working with the FARM PIG and local farmers to solidify all the details. Join us for a moderated discussion on the hopes and future of historic agriculture during the annual conference sessions. Farmers Schools, Institutes, Boot Camps and the FARM PIG provide resources and training for people that preserve the skills of the past for the future. Find out how you can be part of this critical initiative. The title for this discussion will be, “Steadying the Plow: Skills, Training and Preservation in Historic Agriculture.” It will be moderated by Ed Schultz, Colonial Williamsburg Historic Farmer and ALHFAM Skills, Training and Preservation Development Manager and presented by Cody Jollif, Site Manager of Nash Farm and developer of the Farmers Institute; Dave Fowler, Site Manager of Hunters Home of the Oklahoma Historical Society; and Jim Lauderdale, Museum Supervisor of Fort Nisqually Living History Museum and ALHFAM FARM Professional Interest Group Chair. Finally, there have been sixteen responses to the FARM PIG’s Crops Survey. Thanks to all those that have taken the time to submit their information in this quick and easy to complete survey. Sites that have participated include Colonial Williamsburg, Hunter’s Home, Fort Nisqually Living History Museum, Exchange Place Living History Museum, Mahaffie Historic Site, Montgomery Parks Agricultural History Farm Park, President James K Polk State Historic Site, Homestead Prairie Farm, Long Mountain Living History Center, Panhandle Pioneer Settlement, Barrington Living History Farm, Wolf Gap Education Outreach, The American Revolution Museum at Yorktown, Ross Farm Museum and Texas A&M University. The link to the survey is still open and the FARM PIG asks that anyone growing heirloom or heritage crops submit the survey. As always, if you have news or announcements to share with the FARM PIG, please send your information to FARM PIG Chair Jim Lauderdale at jiml@tacomaparks.com. The main piece of news this month is in regards to the Crops Survey that is currently being conducted by the FARM PIG. We are conducting a Crops Survey to learn what heritage crops are being grown by ALHFAM members and non-member living historical farms. Please complete the survey to help us be successful and share with all those who might also be able to contribute. Thank you for participating in this survey and promoting the growth of heritage crops! 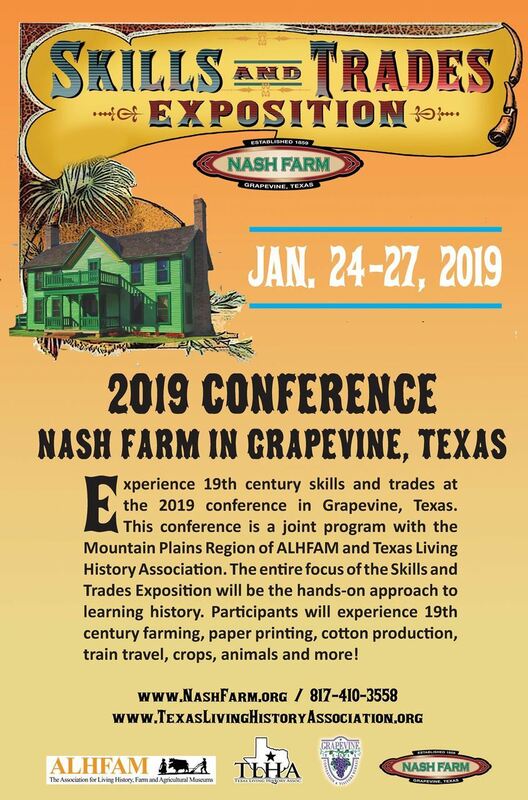 The Texas Living History Association and Mountain Plains Region have teamed up to host a two-day (Thursday & Friday) Farmers Institute at Nash Farm in Grapevine, Texas this January. All are welcome, and registration will open next week. The Farmers Institute at Nash will be led by David Fowler of the Oklahoma Historical Society along with some other great historic farmers. Focus will be on winter work on the farm including trimming hooves on sheep, poultry care, tool care, plowing with draft horses and more. Gulf coast ram for sale at Nash Farm, Grapevine, Texas. Contact Farm Manager Cody Joliff at 817-410-3558 for more information. Ed Schultz, Dave Fowler and Jim Lauderdale will be contacting FARM members to conduct an heirloom grain survey this winter. This will only be successful if we can get good support from our membership. If you are interested in participating and letting us know what heirloom grains you are growing, please contact Jim Lauderdale jiml@tacomaparks.com. Plans are underway to present some excellent hands-on workshops at the ALHFAM 50th Anniversary Conference at Old Sturbridge Village. Currently, there are talks about three days of hands-on farming workshops that cover many different disciplines and specialties. Stay tuned for more details. 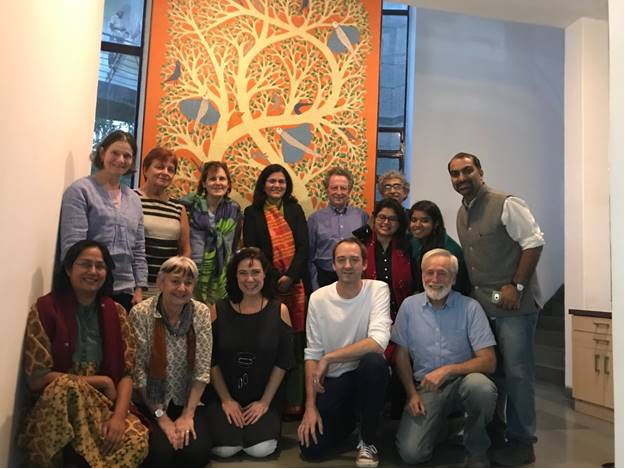 AIMA Board members along with the staff of the Indian National Trust for Art and Cultural Heritage (INTACH). Director of INTACH’s Intangible Cultural Heritage Division, Nerupama Y. Modwel, explained that the mural (installed at the INTACH headquarters on Lodi Road in New Delhi, India), is a Gond painting by an artist from the Gond tribal community, predominantly from the central Indian state of Madhya Pradesh. Photograph by Piret Emily Hion (attendee to the AIMA meeting from Estonia) taken November 26, 2018. Photograph by Piret Emily Hion, Estonia, November 26, 2017, taken at the headquarters of the Indian National Trust for Art and Cultural Heritage (INTACH). Director of INTACH’s Intangible Cultural Heritage Division Nerupama Y. Modwel explained that the mural behind is a Gond painting by an artist from the Gond tribal community, predominantly from the central Indian state of Madhya Pradesh. Nash Farm will host a Farmers’ Institute for the upcoming Mountain Plains Regional Conference in January. The two day program will be led by David Fowler of Hunters’ Home in Cherokee Nation, Oklahoma, along with others in the field. Activities will include poultry care, sheep care, draft horse harnessing and driving, and winter preparation on the farm. The conference is January 24-27, 2019 in Grapevine, Texas. The two day Farmers’ Institute will be on Thursday 24th and Friday 25th. Other sessions at the conference will also focus on farming. Dallas – Fort Worth International airport is in Grapevine and just a 5min drive from hotels and Nash Farm. We hope you’ll consider attending! As always, if you have any FARM news, send it to FARM Chair Jim Lauderdale at jiml@tacomaparks.com. Cody Joliff reports, “Nash Farm has an opening for a part time Living History Interpreter / Maintenance Tech to help with both living history tours and programs along with general farm chores. Email CJolliff@GrapevineTexasUSA.com for more information. Apply online at www.GrapevineTexas.gov." Lauren Muney reports, “The Mid Atlantic ALHFAM meeting is featuring skills workshops and sessions for the first time, including many farm-related sessions, such as “Assessing Livestock Health and Wellbeing”, “Udder to Butter”, “Corn Maze Experience”, "Scrapple, Sausage, and Bacon", and “Round Pen [Horse] Training”. These workshops and sessions are three hours each session, so the attendees will gain a good overview of the subject matter, encouraging deeper learning down the road. Registration is open until Oct 5. As always, if you have anything you would like to share with the FARM PIG, please email FARM Chair Jim Lauderdale at jiml@tacomaparks.com. September is showing no signs of slowing down for us in the FARM world. Here are some updates and things of interest that FARM members have asked me to share. Joel Johnson at Fort Nisqually Living History Museum reports that there will be a Harvest Home event on Saturday, September 8 from 11:00 a.m. to 5:00 p.m. Celebrate the end of summer with a traditional 19th century Harvest Home, a daylong event on Saturday, Sept. 8, at Fort Nisqually Living History Museum in Point Defiance Park. As the weather begins to change, the historical interpreters at Fort Nisqually turn their attention to the harvest and winter preparations. This year’s Harvest Home celebration will feature apple pressing, tours of the heritage garden and the opportunity to sample seasonal treats made in the period kitchen and bake oven. Visitors can learn to make corn husk dolls, weave wheat straw, play popular Victorian games, and help decorate the hock cart that will carry the last sheaf of wheat through the fort to the granary. The Puget Sound Revels will sing and dance to harvest songs and a harvest king and queen will be crowned from among the fort’s teen volunteers. The public is also invited to enter the fort’s jam and jelly competition. A panel of judges will sample all entries and award a special prize for the tastiest preserve. Event admission is $8 to $10, and children 3 and younger are free. For more information visit www.fortnisqually.org or call (253) 404-3970. Debra Senese at the Historic Longstreet Farm in Lincroft, NJ reports there will be a Harvest Home Festival on Sunday, September 30 from 11 a.m.-5 p.m. This old-fashioned country fair takes visitors back to the 1890s, when neighbors gathered to work, harvest, and enjoy each other’s company. Explore your past and join us for a day of fun, featuring wagon rides, games, corn husking and pie eating contests, craft demonstrations, and live music. Submit your needlework, baked goods and homegrown vegetables for judging and you may take home a ribbon! Admission and parking are free. For more information, please call 732-946-3758. Gail Richardson reports that Sauder Village will host a Fowl Butchering 101 Workshop on Saturday, October 13, 2018. The workshop will occur from 8:00am to 12:00pm. The cost per person is $50. To register for the workshop, call 1-800-590-9755 ext. 3034. There is a maximum participant cap at 10 people. Here’s the description of the class: This hands-on class will teach students historic techniques in fowl butchering. Each participant will be able to have a hand in the process of preparing fowl for the table, learning how to humanely dispatch fowl, pluck feathers using a scalding kettle, neatly eviscerate a fowl carcass, and prepare the meat for the freezer. For more information, visit www.saudervillage.org. Kim Breed at Barrington Living History Farm reports that they recently had an Ossabaw Island Hog sow give birth to eleven piglets. Barrington has been involved in the preservation of historic breeds for several years and has always produced good breeding stock. Here’s a photo of the piglets, (see attached). As always, if you have information that you want to share with other ALHFAM and FARM members please email the FARM Chair at jiml@tacomaparks.com. Hopefully the summer event season has been a successful one for you. August typically marks the last month of those summer events and many places/living historians begin to look forward to the autumn events that are right around the corner. On August 11 and 12, Fort Nisqually Living History Museum will host the annual Brigade Encampment. While the main focus of this event is on the fur trade as it relates to the historic Fort Nisqually, there will be an agricultural focus on saving seeds from the summer harvest. On September 1, Howell Farm in Lambertville, New Jersey, will host their annual plow match during Labor Day weekend. 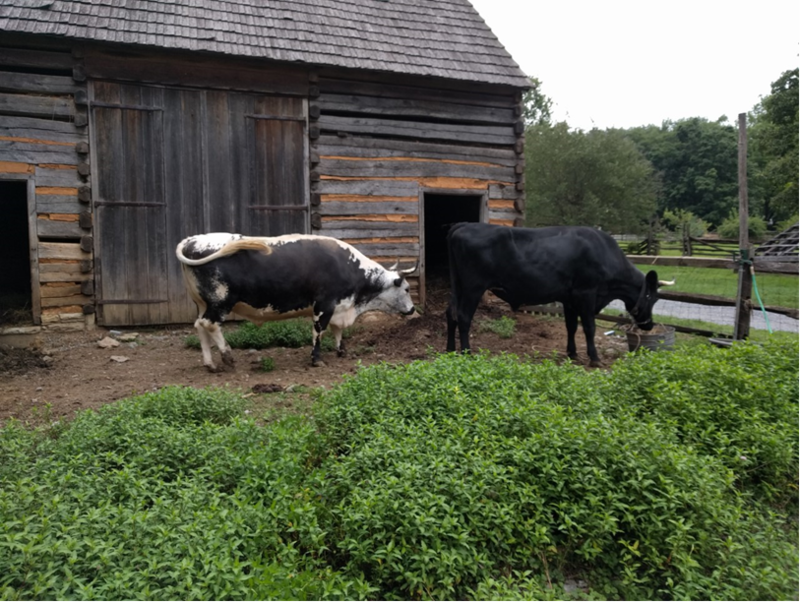 A fun note that was shared by Barbara Corson included the fact that Landis Valley Museum in Lititz, Pennsylvania, has a new ox, four year old cross-breed named Sable. Sable joins the museum’s ox in residence, Patrick, a seven year old Randall Lineback. Finally, Lauren Muney reported the following: “ALHFAM has started on a new initiative, Skills Training and Preservation (“STP”), designed to help our ALHFAMily document and preserve important skills, details, and training needed for working your sites and passing down vital interpretation, trades information and/or even activities needed to make your site work well. These skills are especially important on historic-farm sites as well as village- and trades- sites. The initial ideas are being formed now, and will be ready for presentation to ALHFAM as a whole in early 2019. Look for this exciting and vital new addition to ALHFAM’s mission to bring history to life.” Hopefully, members of the FARM PIG will support this new initiative in any way possible. Those are all of the updates that were shared by the time the eUpdate was published. As a reminder, if you have news about things happening in your area, please send those details to FARM Chair, Jim Lauderdale by emailing jiml@tacomaparks.com. July is here and hopefully you enjoyed an Independence Day celebration of your own. The old saying, “Knee high by the fourth of July,” doesn’t apply to our friends at Hunter’s Home – our host for the national conference. Their corn was over head high within two weeks of the conference. Thanks again for hosting a great conference. Congratulations to all of our winners and thanks to all competitors for keeping this ALHFAM tradition alive and well! The Farm PIG supported Farmer’s Boot Camp: Poultry 101 was also a great success during the conference workshops. A big THANK YOU to Barb Corson, Victoria Haynes and Dave Hruska for leading the workshop and to the staff of OHS and Hunter’s Home that led the building of the chicken coop. Thanks to the FARM PIG members that attended the annual PIG meeting. I have attached those meeting minutes here for all to view. Stepping away from the conference now, Cody Joliff at Nash Farm in Grapevine, Texas commented that he is looking for a list of Wagon Makers. Nash Farm is interested in buying a hotel taxi, wagonette style perhaps for hauling a small group, which would be horse drawn. They are also looking for chuck wagon box plans & hardware. Contact Cody Jolliff cjolliff@grapevinetexasusa.com if you have information to share. As always, if you have news, updates, questions or concerns, you may contact the FARM Chair, Jim Lauderdale, at jiml@tacomaparks.com. Barbara Corson reports the workshop "Keeping a Home Dairy” at Landis Valley Museum is scheduled for June 14 and 15. Landis Valley Museum will be the host and the instructor will be Barbara Corson. Both the host site and the instructor are ALHFAM members. Here is a link to the event: http://www.landisvalleymuseum.org/index.php/visit/calendar-events/summer-institute/. Ben Baumgartner, Barrington Living History Farm, reports that Barrington has a new team of Durham (Milking Shorthorn) oxen. Three total, the pair are Marco and Polo, and as a single we have William. Having just arrived to our park from Kentucky in the middle of May, they have already settled in well and have been put to work cultivating the fields of cotton and corn. We hope to rejuvenate our historic farming by exclusively using draft animal power (no behind the curtain cheating with the tractor.) We’re starting with cultivation for now, but are hoping to incorporate plowing by the fall. By now, I’m sure many of you are well on your way to having your crops planted or at least having your fields prepared. Joel Johnson, Fort Nisqually, reports that garden peas, lettuce, potatoes, leeks, beets, carrots, and a few other vegetables have all been planted and are coming up quite nicely. Additionally, barley and peas have been planted as field crops. This will be followed up with turnips and Coleseed soon. The poultry yard is being worked and refreshed now using historic farming practices. A quick reminder to register for the Annual Conference in Tahlequah, OK, if you have not already. The Farm & Livestock PIG is looking forward to the annual plowing match and hope you are too! We will also host the annual meeting of the Farm & Livestock PIG during the conference. If you have items to add to that meeting agenda, please send to Co-Chair Jim Lauderdale at jiml@tacomaparks.com. April is here, spring is in the air, and many ALHFAMers are busy planting or making preparations to plant this year’s crop. Here’s a few words from FARMers around the country. Cody Joliff, Nash Farm, reports two ram lambs (Gulf Coast Native) were born recently. Nash Farm is interested to know what GCN breeders are in their region (Mountain-Plains) as they are looking to buy, sell, or trade for a new ram. For those that do not already use this site, The Livestock Conservancy posts heritage breed information including breeders on their website. Nash Farm will also host their annual Spring into Nash event on April 21. For more information, visit https://www.grapevinetexasusa.com/nash-farm/events/spring-into-nash/. Joel Johnson, Fort Nisqually, reports that the spring garden is well underway with potatoes, peas, and greens all being planted. Coleseed, turnips, and barley are also slated to be planted at Fort Nisqually’s annual Sewing to Sowing event on April 14. For more information, please visit https://www.metroparkstacoma.org/fort-events. Ed Schultz, Colonial Williamsburg, would like to remind everyone that the ALHFAM Seeds and Plants Committee was absorbed by the FARM PIG during the annual meeting last year. Anyone interested in heritage seeds/plants are encouraged to reach out to the FARM PIG by email or on the Historic Farming Facebook page. As always, if you have news you want to share or a question to ask the group, please email co-chair, Jim Lauderdale at jiml@tacomaparks.com. In January we were able to concentrate on building some tools for our field work. The spike tooth cultivator was a project that had great importance, being able to do more than just cultivate, it was a common tool turned to when soil needed to be stirred, weeded, loosened, aerated or otherwise torn up. The cultivator is the crotch of a larger tree with even branches. 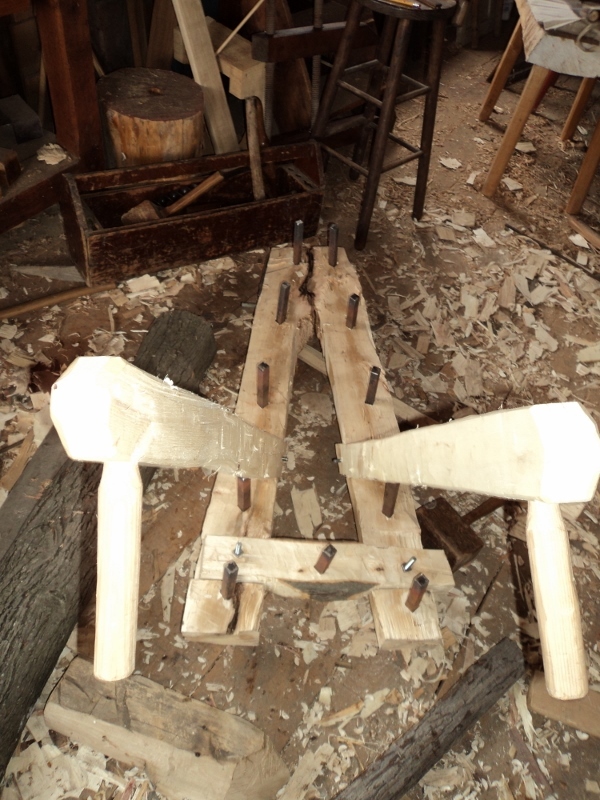 The tree section is then hewn to have even faces top and bottom, this will aid in the drilling and mortising of the holes for the harrow teeth. One long bolt should be placed through the cultivator to secure the bottom of the V from eventual wear and possible splitting. The Bottom of the V should also have a bracket from which it is pulled. Harrow teeth made from 3/4 inch square stock should be tapered to a point and have a blunt head. Depending on the aggressive nature of the device the number of teeth can very. We choose 11 teeth. To lay out the teeth it is best to hang the device on a block and tackle. Next use string weighted with common 1/2 inch nuts. Take each string and stick a thumb tack to it where the tooth should be located. See the picture attached for the overall look. This is a step of the design that will benefit from more careful placement. Examine any early cut of a harrow and you will find the cut shows the tooth pattern with lines traced to the rear of the harrow; as if it were creating those marks as it moved forward. Once the tooth pattern is identified drill and mortise each tooth in. The last step is to make the handles. They should be mounted with extra space to walk between the device. As many harrows do, this device might require cleaning from clogged material. Be mindful of this when placing the handles. As noted in “Sowing Modernity” the design of the cultivator of this style will face the same issue as the V or A framed harrows. The tooth or teeth which cut the center mark should not be located in the front, instead shift it to the rear of the device. This will ensure the device’s over all shape it allowing the ground to be torn into instead of creating a furrow as wide as the device is. December brings the cool Blue Northers; those cold fronts that blow in from the North that, behind the howling winds, rests a clear blue sky, crisp cold mornings and dry weather. The farmers at Barrington relish those weather fronts. At last we can say goodbye to the triple digit days of scorching heat and relentless humidity if only for a few short months. The corn as already been harvested, hauled to the mill and brought back to the farm in the form of meal. Cotton has been harvested, the bare stalks burned off the fields and the ashes plowed under. With major field work behind us, the farmer at Barrington have spent December focusing on rail splitting, fence repair and building. We have created a new livestock paddock that gives us additional space to hold oxen, cows and calves or visiting livestock. In lieu of caps many farmers use wire for holding the stakes together, which, by many, is considered preferable to caps. We took his advice and used wire. This was our first endeavor making a “stake and cap” style rail fence and the end result we are quite pleased with. While it may lack the height provided by a “stake and rider”, it rivals and may even surpass it in stability and strength. It was also economical as it reduced the total number of rails required for the project by nearly 300. The winter months provide a brief reprieve from field work and allow us to take time to mend and make new. March will be here soon, which means corn planting time! October, more than any month in the calendar, evokes images of harvest time. Corn shocks and pumpkins have been interwoven into our common psyche as signs of fall and harvest. For most corn loving American farmers this is true, but for the grain loving Germans of Schaumburg Illinois October means planting time. Schaumburg Township, located just west of Chicago, was a haven for German Lutherans in the last half of the 19th century. Starting around 1850, German immigrants developed a conservative closed society based around their Missouri Synod Church. These new settlers from the old world new little to nothing about corn and chose instead to focus their attention on small grain production. In 1880 Schaumburg farmers produced more than nine times as many bushels of oats than the national average for farms across the country. They also produced more than three times as many bushels of wheat and twice as many bushels of flax, rye and buckwheat. With all of these crops coming ready for harvest between July and August, the fall was left open for that peculiar practice of planting winter wheat. Today at Volkening Heritage Farm we follow the patterns and seasons of Schaumburg’s German Forefathers. As such, every October we plow down the oat stubble and plant hard red winter wheat. As Schaumburg farmers were not to apt to adopt new technology either, we forgo the drill and plant broadcast style with the help of several hundred school kids. Children are wonderful little soil tampers and with a quick harrowing, to even out the large piles of spilled grain, we have a finished wheat field ready for the snow. 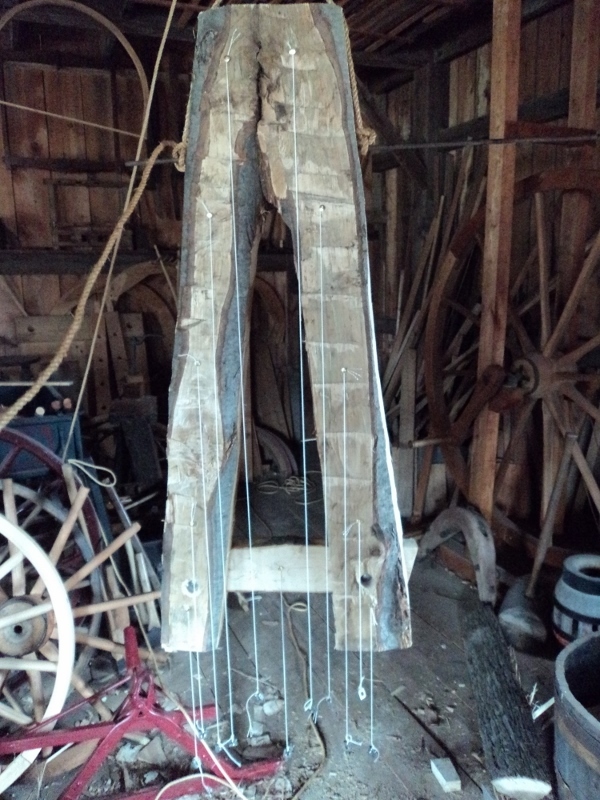 Our larger replica harrow of 1963 finally wore out, necessitating research to determine an appropriate replacement. Traditional European precedents suggested square frame over triangular. George Washington drew a picture of one, copied from Kames’ The Gentleman Farmer, Edinburgh, 1776. Kames identified it as “common”, and provided detailed specs. It conformed nicely to other square spike toothed coarse harrows. So we built one this spring. 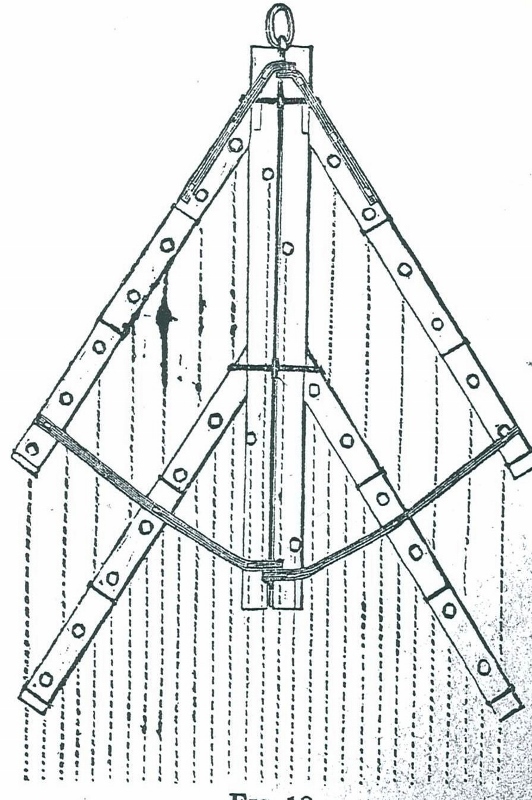 The available white oak timber for the “bulls” (main timbers through which the spikes are set) was one inch thinner than Kames’ prescribed 3 ½” thickness, but otherwise all dimensions were the same. Since the wood had been salvaged from hurricane Irene (2011), it had twisted so that modern mechanical planning was necessary to keep the four 5 foot long bulls in plane to receive the smaller cross pieces making the frame. 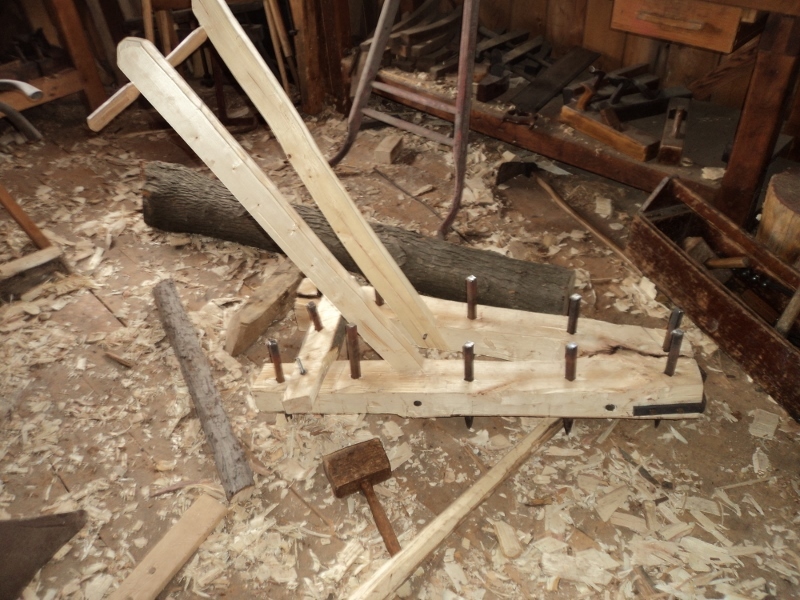 Those mortises were also mechanically cut because they needed to be perfect, and I didn’t possess the time, patience, or skill to cut sixteen perfectly by hand! Our blacksmiths made the hardware which consisted primarily of twenty rather long iron spikes. All components were joined in time for late spring plowing. Shortly after delivery we experienced severe checking of the bulls, indicating that the wood, though sealed, had not cured sufficiently. Teeth loosened. The remedy will require an undocumented (though period appropriate) reinforcement consisting of additional iron end brackets. So far the new harrow draws well from a hemp rope connector, and breaks down newly plowed ground well. Its coarse tooth pattern and high riding frame keep clogging to a minimum. Additional weight keeps its tail down so all twenty teeth can work. The Genesee Country Village and Museum is currently smoking our yield from hog butchering. Last year we did this process with mixed results, but new changes to our brine recipe, and smoking method should produce better results this year. This years yield was butchered on Saturday 11-24-12. After which we dry cured with salt and saltpeter. Once the pork was sweated enough we mixed up our brine, which came on recommendation by Chris and Susan Gordy. The meat was submerged in the brine for several weeks, while being turned once a week. Upon completion of the brining process the meat was hung in the smokehouse. We plan on smoking the meat continuously for five to six weeks. Currently we are burning cherry and apple wood to produce the smoke needed. The trees that were harvested for the smoking were cut down live about 4 months ago. Some was split, but most was kept in a larger size to smolder rather than burn. Unlike most accounts of the fires position in the smokehouse, we have settled on our previous method of burning the wood inside an old cast iron kettle. The constriction of air movement plays itself to our cause of creating a bed of embers with little flame. Though we have a stone smoke house and could use the dirt floor we have settled on this method with good results. We are still in the stage of experimenting with this process and are excited to see the results of this years hard work. We hope to experiment with burning corn cobs instead of fruit wood, as well as possibly advancing our brine.